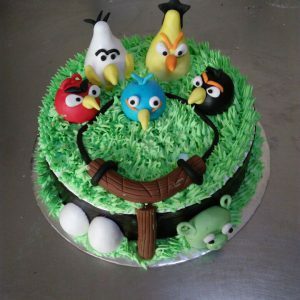 Angry Bird Fondant Cake is a fantastic cake which can impress your little one very much. All the cute edible angry birds and their eggs are prepared with various flavors like chocolate, vanilla, butterscotch and blended with fresh whipped cream. The chocolaty catapult beautifies the cake with fresh chocolate cream and chocolate waffles. This cake is an ideal gift for birthday parties and children day celebration. 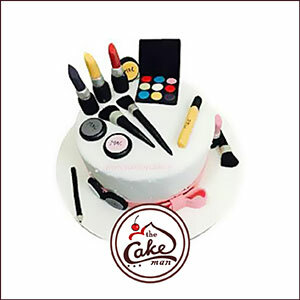 Make up kits are always the best gift for women and our Designer shopping cake is providing you this beautiful make up kit cake which is a blend of great taste and great looks. This fondant cake is a mixer of vanilla essence and fresh whipped cream. This stylish and sleek Designer Shopping Cake will definitely blow the mind of your lady love or your sister. Present this luxurious and tasty cake to your dear ones on their birthdays to win their heart with grace. 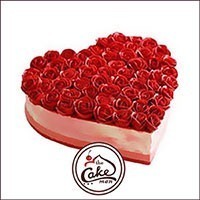 This angelic Heart Shape Red Fondant Cake is a three layered romantic dessert with red roses designed on the sides and top of the cake. This romantic heart shape cake is prepared with whipped cream, yummy cream cheese, granulated sugar, fresh rose extracts, butter and baking powder. Red Roses on a heart reveals the hidden feelings of the heart and when it is designed in a cake form it becomes more special. Surprise your sweetheart by gifting this cake on anniversary day and show your love to her. Mickey Mouse Cake is the coolest birthday cake for your little sweetheart. It can also be ordered for someone who is a Mickey Mouse cartoon lover. The smiling face of Minnie with her pink ribbon has been made with multi-layers and given a shape with butterscotch, chocolate and strawberry frost. 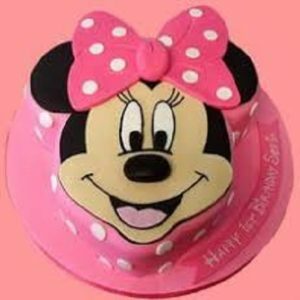 Top of the cake is blended into the shape of Minnie’s face. Make your child’s birthday too special with this cute cartoon cake. Strawberry Red Fondant Rose cake is the perfect cake which can change a simple anniversary day into a memorable and romantic day. This moist cake is layered with mouth-watering strawberry cream. 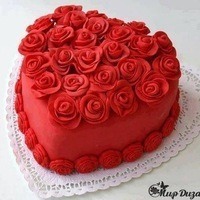 Top of the cake is decorated with glamorous red edible roses which are made with rose extracts and strawberry cream. This lovely present filled with delicious taste, will show your love and warmth to your loved ones.